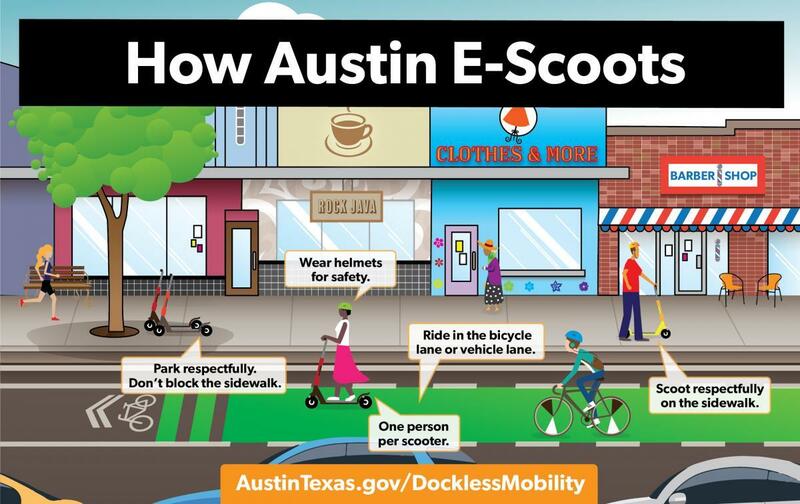 City of Austin Transportation officials are focusing on rules for scooters operating in the city right now but are always on the lookout for the next transportation innovation that could hit city streets. City transportation officials say the bottom line is that scooter riders have to follow the same rules as bicycles on the road. They emphasize riders of scooters and bikes should be aware of their own skills and capabilities before they set out. "What we're trying to put out mainly is this all ages and all abilities policy," says City of Austin Mobility Services manager Jacob Culberson. "If somebody is new to riding scooters, they have the ability to choose whether they'd want to be on the sidewalk or be in a bike lane or on the street when they ride." Pedestrians First — Yield to people walking on sidewalks. Park Responsibly — Park in a secure, upright position in designated areas, such as furniture zones of sidewalks, public bike racks and other marked parking zones. On sidewalks, give at least 3 feet of clearance for accessibility. Stay on Right of Way — Do not take dockless devices to unauthorized areas, such as private property, parkland, or state-owned land, unless otherwise authorized. Of course, there are other rules if you plan to ride on the UT campus. We spoke with Culberson and the city's parking enterprise manager Jason Redfern late last year about the rules that govern scooter and bike operations on Austin roads and sidewalks. Jason Redfern: [Scooters are] expected to follow the traffic rules that a bicyclist would have to follow. If they approach a stop sign, they're supposed to stop at the stop sign. They're supposed to signal when they are making movements. Anything that a bicyclist would have to do in traffic, a scooter rider would have to do as well. KUT: Where can scooters operate: sidewalks? Streets? Bike lanes? Where are they supposed to be? Jacob Culberson: What we're trying to put out mainly is this all ages and all abilities policy. If somebody is new to riding scooters, they have the ability to choose whether they want to be on the sidewalk, or be in a bike lane, or on the street when they ride. Now of course, when they ride on a sidewalk we do ask that they stay at a safe speed and that they monitor their speed particularly when around other pedestrians. KUT: If someone is on a scooter or a bicycle and they're in a road, do they go with traffic or against traffic? Redfern: Absolutely they go with traffic. They are expected to follow the direction of travel of the road they're on. So if they're going the wrong way down a one way street, that is exactly illegal; they should not be doing that. KUT: What if there's a road and there is no bike lane? What are bikes and scooters supposed to do to make sure that they're operating safely through those areas? Culberson: In those areas we ask that scooter riders would behave essentially just as a bike rider and engage in the rules of the road as applicable for the street that they're riding on. If someone is unfamiliar with those rules, we would ask that they investigate the correct ridership rules before they ride. KUT: When someone on a bicycle or a scooter encounters a pedestrian, what are they supposed to do? Redfern: It really depends on the situation. At any time if they're going to encounter a pedestrian, they should slow down and yield the right of way to the more vulnerable user. If you're a scooter rider or bicycle on a sidewalk and you see pedestrians, you're supposed to slow down and you're supposed to yield to the pedestrians. KUT: What we hear a lot of is frustration and concern that folks are out there operating scooters and don't know the rules of the road and are kind of doing what appeals to them or what seems like fun or just sort of whatever they want — and it often seems dangerous. Culberson: We do ask people that they ride responsibly when they're out there. Right now we're receiving on average about 12 complaints a day. But it's mostly having to do with the parking of the scooters on our right of way — scooters that are improperly parked or left behind by the riders. Very few are companies staging efforts. We address those immediately. KUT: What are the rules about scooter and bicycle parking in the city? Redfern: The vendors have specific rules for deployment. They have to leave ADA [Americans with Disabilities Act] accessible pathways. They can't crowd bus stops or park at bus stops unless they've got permission from Capital Metro in a specific location to park them. They can't park them on a residential sidewalk that's say four feet or less. So really when you're parking a dockless scooter or bicycle, you have to look at the built environment and make sure that there's enough pathway width so that somebody in a wheelchair can make it by the dockless scooter or bicycle safely and conveniently. KUT: If somebody is walking down the sidewalk and there's a scooter stretched out in front of them because somebody just left it there — is that a complaint that goes to APD? Does that go to your department? Does that go to that particular scooter company? Culberson: If anybody encounters a problem with scooter parking, or they see behavior on a scooter that is inappropriate or improper, we ask they call 3-1-1 within the city right away. And those go directly to me and my enforcement staff to be addressed immediately. If it's an issue with parking where scooters need to be rebalanced or removed, we contact the companies directly and have them remove it. We're able to also through the 3-1-1 system track and monitor and of course keep statistics on what is being reported so that we can report accurately to the mayor and City Council. KUT: How do you think scooters have been received so far? Redfern: It's kind of a 50/50 split almost. You know some people really don't like them, and some people do. But we see dockless scooters and bikes as just another mode of transportation to get people around — another transportation option. KUT: Two years ago were you all thinking that this would be something you would be dealing with? Redfern: We did not know that we would have this amount of interest or the amount of rides that we're seeing. This mode has just kind of exploded. KUT: Do you have to spend part of your day or part of your job sort of wondering what's the next dockless scooter that two or three years from now we're going to have to be figuring this all out for that? Culberson: It's a constant monitoring of what's going on in the country and in the world. And there are some other innovative technologies that are that are on their way. Culberson: Jet packs — jet packs not so much yet. KUT: What are some of the more realistic ones that you all are already sort of pondering and thinking about? Culberson: Pods have been mentioned, and pods are a new technology that are coming out. It's a system that's similar to what we've seen with Car-to-Go and Zipcar. However it's a smaller vehicle that's all electric so that's something that's on the horizon right now that we're monitoring and learning more about at this time.